Steven R. McQueen just can't keep his shirt on...and nobody is complaining. 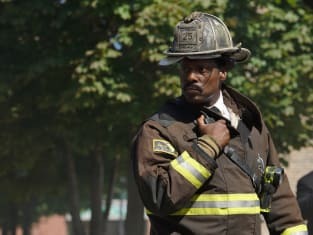 In fact, McQueen may be new to Chicago Fire Season 4 - but he's already stirring things up in the firehouse as Jimmy works to find his place ... and now it looks like he may have his first romance with Chili. During Monday's #NBCChicagoDay in the Windy City, the cast of Chicago Fire, Chicago PD and the upcoming Chicago Med turned up to talk about the city and their respective shows, including the upcoming crossover event. McQueen told us about the very different role he's facing now in a much-more grounded show than The Vampire Diaries, where he played Jeremy Gilbert for many years. Let's see what he had to say about that and also his recent participation in the Chicago Marathon. Now it's time to get back to shirtless McQueen because co-star Dora Madison, who plays Chili, is more than happy to see the actor get out of his clothing. Or at least some of his clothing. The actress also told us whether Chili and Jimmy could become a real romantic item or will this just be a fling. And were you surprised by Kara Killmer's singing during the firehouse wedding in Chicago Fire Season 4 Episode 5? Killmer was just as shocked since she didn't find out she'd have to sing until two days before shooting. Chicago Fire airs Tuesdays at 10/9c on NBC. I'm not distraught, I'm angry, okay? Are you this worried about male firefighters' emotional condition when they return from medical leave? All right guys, please stop, you can take the kid gloves off. What happened, happened. I've been cleared for duty, ready to work, and I am happy to knock anyone's teeth out who treats me like a snowflake. Chicago Fire Round Table: Who's Next?